You are currently browsing the category archive for the ‘firing’ category. The Gulf Coast Kiln Walk Society, out of Navarare, Florida, has some pretty cool and exciting things coming up this fall, including the second firing of their 32 foot anagama kiln which they built and fired for the first time last year. 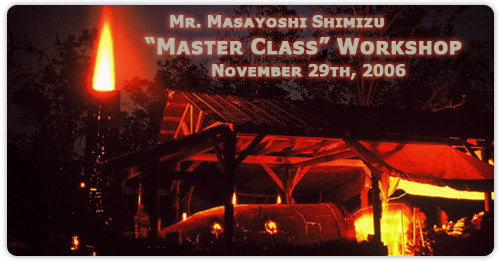 Mr Masayoshi Shimizu from Iwade City, Japan, will be arriving November 27th to orchestrate the firing which will take place the first week of December. While the deadline for members to submit a piece to the firing has passed, its a great opportunity to and see a master at work and find out what the excitement of an anagama firing is all about. Mr Shimizu will also be holding a master class and slide presentation at the University of West Florida on Wednesday, Nov 29. As per the Kilnwalk calendar, please note that all events are free and open to the public. Please click on the links above or call 850-939-2744 for more info.